The varied reactions of the host to infection, inflammation, or trauma are collectively known as the acute-phase response and encompass a wide range of pathophysiological responses such as pyrexia, leukocytosis, hormone alterations, and muscle protein depletion combining to minimize tissue damage while enhancing the repair process. The mechanism for stimulation of hepatic production of acute-phase proteins is by proinflammatory cytokines. The functions of positive acute-phase proteins (APP) are regarded as important in optimization and trapping of microorganism and their products, in activating the complement system, in binding cellular remnants like nuclear fractions, in neutralizing enzymes, scavenging free hemoglobin and radicals, and in modulating the host's immune response. APP can be used as diagnostic tool in many diseases like bovine respiratory syncytial virus, prostate cancer, bronchopneumonia, multiple myeloma, mastitis, Streptococcus suis infection, starvation, or lymphatic neoplasia. Thus, acute-phase proteins may provide an alternative means of monitoring animal health. The changes in the concentrations of APPs are largely due to changes in their production by hepatocytes. The magnitude of the increases varies from about 50% in the case of C-reactive protein (CRP) and serum amyloid A (SAA). Under the influence of interleukin (IL), i.e., IL-1, IL-2, and tumor necrosis factor - alpha (TNF-α), liver cells synthesize and secrete APPs. The maximum serum concentration of APPs is typically reached within 24 to 48 h after the initiation. A decline coinciding with the recovery from the infection is seen,  and generally, feed-back regulations will limit the response leading to its resolution within 4-7 days after the initial stimulus if no further stimulus occurs. When the receptor triggering has repeated pulses, the APR can become chronic. The three most important APPs are CRP, serum amyloid P (SAP), and SAA. Many APPs, such as CRP and SAA bind to microbial cell walls and they may act as opsonins and fix complement, thus promoting the elimination of microbes. An APR is characterized, among other things, by fever and increases the numbers of peripherals leukocytes, in particulars, increasing the numbers of circulating neutrophils and their precursors. At the same time, cellular and biochemical alterations, in particulars the coordinated synthesis, of so-called APPs or APRs by hepatocytes take place in the liver [Figure 1]. According to Beutler and Cerami,  the APR is stimulated by the release of cytokines such as IL-1, IL-6, and TNF-α from macrophages and monocytes at the site of inflammatory lesions or infections. Inflammatory cytokines such as IL-6, IL-1, TNF, and others such as transforming growth factor (TGF) and interferon (IFN) are produced by inflammatory cells. These proinflammatory cytokines induce local and systemic reactions. These mediators are involved in cell activation of leucocytes, fibroblast, endothelial cells, and smooth muscle cells, result in a systemic release of cytokines, increase in the circulation of the cytokines, and then stimulate the hepatic APR. Systemic reaction results in activation of the hypothalamus, reduction in growth hormone secretion, and a number of other physiological changes characterized by fever, anorexia, and catabolism of muscle cells. TNF-α, IL-1β, and INF-γ are crucial for the expression of inflammatory mediators such as prostaglandins and leukotrienes and they induce the production of platelet-activating factor and IL-6. After stimulation by proinflammatory cytokines, Kuffer cells in the liver produce IL-6 and present it to the hepatocytes. Thus, IL-6 is the major mediator for the hepatocytic secretion of most of the APPs. Activities are enhanced indirectly by activation of the pituitary/adrenal gland axis, which involves synthesis of adrenocorticotrophic hormone (ACTH) and subsequent production of cortisal. The increase in glucocorticoids during the APR is a result of cytokine stimulation of the pituitary-adrenal axis to produce adrenocorticotrophic hormone. As a result, an increase in corticosterone, the main glucocorticoids, is observed later than the appearance of IL-6. Cortisol can enhance expression of IL-6 receptors in liver cells and thus promotes IL-6-mediated synthesis of APPs. Glucocorticoids are hormone that can be involved in APR as in mammals. The role of glucocorticoids in birds seems to be both stimulatory and regulatory. The administration of glucocorticoids to domestic fowl can also stimulate APP synthesis hormone,  which suggest that glucocorticoids may work independently of cytokines. Negative regulatory loops can involve inhibition of synthesis of IL-6, IL-1, and TNF by cortisol and inhibition of the synthesis of IL-1 and TNF in monocytes by IL-6. Of all mediators participating in the induction and regulation of APP synthesis, IL-6 appears to induce the broadest spectrum of APPs whereas IL-1 and TNF only induce the synthesis of subsets of these proteins. The liver responds by producing a large number of APRs. At the same time, the production of a number of other proteins is reduced; these are therefore referred to as "negative" APPs. Negative APPs are albumin, transferring, transthyretin, transcortin, and retinol-binding protein. Positive APPs are CRP, D-dimer protein, mannose-binding protein, alpha 1 antitrpysin, alpha 1 antichymotrypsin, alpha 2 macroglobulin, fibrinogen, prothrombin, factor VIII, von-Willebrand factor, plasminogen, complement factors, ferritin, SAP complement, SAA, ceruloplasmin (Cp), and haptoglobin (Hp). Positive APPs serve different physiological functions for the immune system. Some act to destroy or inhibit growth of microbes, e.g., CAA and Hp. Others give negative feedback on the inflammatory response, e.g., serpins, alpha 2 macroglobulin and coagulation factors affect coagulation. Positive APPs are produced during the APR associated with anorexia and changed metabolism. APP classified as below: Protease inhibitors, e.g., alpha 1 antitrypsin, alpha 1 antichymotrypsin. Coagulation proteins, e.g., fibrinogen, prothrombin. Complement proteins, e.g., C2, C3, C4, C5, etc. Transport proteins , e.g., Hp, Cp, hemopexin. Other proteins, e.g., CRP, SAA, SAP, acid glycoprotein (AGP). The concentration of most of the APP increases, whereas other plasma proteins show decrease in their basal levels. Some APPs are present at very low concentration in normal state and may show increase up to 100 fold. This is the case of CRP or SAA in humans. Others increase between 2 to 10 times, whereas minor APPs are modified less than twofold. The APP pattern may vary from one species to another. As example, CRP that is a major APP in humans or dogs does not modify its concentration in cattle or cats. Other main APP in the pigs is CRP and Hp (increase of 8-10 and 2-10 times, respectively, in the turpentine model). SAA has also been described as a major APP and Cp is a minor APP in pigs. Beside albumin, fetuin and transferring are negative APPs (decreases of 20-40%). In cattle, Hp and SAA are major APPs while fibrinogen, alpha-AGP, Cp, and alpha-antitrypsin are minor APPs in the cattle. SAA is the most studied APP in cattle. It can increase around 2-8 times during an APR and seems to react faster than Hp after the inflammatory stimuli. In sheep, haptoglobin is a major APP in the sheep. Its concentration was raised up to 100 times after injection of yeast, whereas Cp and fibrinogen increased around four times, and albumin decreased. Increases of SAA of around 10 times normal values have been observed in ewes with mastitis induced experimentally. SAA also increased in milk. The function of positive APPs is regarded as important in optimization and trapping of microorganism and their products, in activating the complement system, in binding cellular remnants like nuclear fractions, in neutralizing enzymes, scavenging free hemoglobin and radicals, and in modulating the host's immune response. CRP is the first described APP in 1930. It binds directly to several microorganisms, and activates the complement system by the classical C1q pathway, and acts as opsonins. SAA was first described in 1994 and is an apolipoprotein of high-density lipoproteins (HDL). An APP is thought to influence HDL-cholesterol transport. In tissues, it attracts inflammatory cells and inhibits the respiratory burst of leukocytes. It is also described to bind lipopolysaccharide (LPS), comparable to LPS binding protein. Hp strongly binds to hemoglobin, has anti-inflammatory capabilities, and binds to integrins on leukocytes. Although representing a positive APP, its quantity may decrease on massive erythrolysis and when blood is hemolytic. Cp has histaminase, ferroxidase activity, and scavanges Fe 2+ and free radicals, while a2 macroglobulin (a2 MG) binds to proteolytic enzymes [Table 1]. In the past, the innate immune system was considered to be a primitive static system; nowadays delve into its complexity. It is a system that is able to recognize and respond to danger signals represented by a limited number of highly conserved structures of microorganisms [pathogen-associated molecular patterns (PAMPs)] and several cell products associated with a breach in defenses. For this purpose, the innate immune system possesses a large number of soluble (e.g., pentaxins), membrane-bound [e.g., toll-like receptors (TLR)], and cytosolic (e.g., nod-like receptors) "receptors." They are known collectively as pathogen recognition receptors, or pattern recognition receptors, but a more accurate term is pattern recognition molecules (PRMs). CRP was originally discovered by Tillett and Francis  in 1930 as a substance in the serum of patients with acute inflammation that reacted with the C-polysaccharide by the liver and by adipocytes. CRP levels rise dramatically during inflammatory processes occurring in the body. CRP rises up to 50,000 fold in acute inflammation, such as infection. It rises above normal limits within 6 h, and peaks at 48 h. CRP binds to phosphorylcholine on microbes. It is thought to assist incomplete binding to foreign and damaged cells and a cell enhances phagocytosis by macrophages, which express a receptor for CRP. It is also believed to play an important role in innate immunity, as an early defense system against infections. CRP is used mainly as a marker of inflammation and infection. Measuring and charting CRP values can prove useful in determining disease progress or the effectiveness or treatments. Viral infections tend to give a lower CRP level than bacterial infection. Patients with elevated basal levels of CRP are at an increased risk of diabetes, hypertension, and cardiovascular disease. CRP can exacerbate ischemic necrosis in a complement-dependent fashion and that CRP inhibition can be a safe and effective therapy for myocardial and cerebral infarcts; this has only been demonstrated in animal models. Various analytical methods are available for CRP determination, such as enzyme linked immunosorbent assay (ELISA), immunoturbidimetry, rapid immunodiffusion, and visual agglutination. To measure the CRP level, a "high-sensitivity" CRP or hs-CRP test needs to be performed and analyzed by a laboratory. This is an automated blood test designed for greater accuracy in measuring low levels of CRP, which allows the physician to assess cardiovascular risk. If a result in the low-risk range is found (<1 mg/L), it does not repeating. Higher levels need repeating, and clinical evaluation as necessary. According to the study conducted by Zacho et al., on genetically elevated CRP and ischemic vascular disease showed that CRP genetic variation was associated with elevated CRP levels without predicting an increased risk of ischemic vascular disease. Genetic variants that are associated with lifelong increases in plasma CRP levels are not associated with an increased risk of ischemic heart disease or ischemic cerebrovascular disease. The increase in the risk of ischemic vascular disease associated with higher plasma CRP levels observed in epidemiological studies may not be causal, but rather that increased CRP levels are simply a marker for atherosclerosis and ischemic vascular disease. Serum amyloid A (SAA) proteins are a family of apolipoproteins and produced by the liver. These proteins play a highly essential role in all animals. Acute phase SAA proteins (A-SAAs) are secreted during the acute phase of inflammation. These proteins have several roles, including the transport of cholesterol to the liver for secretion into the biles, the recruitment of immune cells to inflammatory sites, and the induction of enzymes that degrade, such as amyloideosis, atherosclerosis, and rheumatoid arthritis. Several isotypes of SAA are found; types 1 and 2 represent positive APPs. In the bovine, also a negative protein crossreacting with anti-SAA serum has been described. The acute phase SAA isoforms have been reported in mice, called SAA1, SAA2, and SAA3. Haptoglobin (Hp) is a protein in the blood plasma that binds free hemoglobin released from erythrocytes with affinity and thereby inhibits its oxidative activity. The haptoglobin-hemoglobin complex is used to screen for and monitor intravascular hemolytic anemia. Haptoglobin is produced mostly by hepatocytes but also by other tissues, e.g., skin, lung, and kidney. Reticuloendothelial system will remove the haptoglobin-hemoglobin complex from the body; haptoglobin levels will be decreased in hemolytic anemia. In the process of binding hemoglobin, haptoglobin sequesters the iron within hemoglobin, preventing iron-utilizing bacteria from benefiting from hemolysis. Haptoglobin is ordered whenever a patient exhibits symptoms of anemia, such as pallor, fatigue, shortness of breath, along with physical signs of hemolysis, such as jaundice or dark-colored urine. Decreases in haptoglobin can support a diagnosis of hemolytic anemia, especially when correlated with a decreased RBC count, hemoglobin and hematocrit, and also an increased reticulocyte count. If the reticulocyte count is increased but the haptoglobin level is normal, this may indicate that the cellular destruction is occurring in the spleen and liver, which may indicate a drug-induced hemolysis or a red cell dysplasia. The spleen and liver recognize an error in the red cell and destroy the cell. This type of destruction does not release hemoglobin into the peripheral blood, so the haptoglobin cannot bind to it. Thus, the haptoglobin will stay normal. If there are symptoms of anemia, it is most likely not due to hemolysis but instead some other error in cellular production, such as aplastic anemia. Haptoglobin levels which are decreased but do not accompany signs of anemia may indicate liver damage, as the liver is not producing enough to begin with [Table 2]. The collectins, especially MBP and the alveolar surfactant molecules SP-A and SP-D, have many attributes that qualify them for a first-line role in innate immunity. These include the ability to differentiate self from nonself, to bind to a variety of microbes, to generate secondary effector mechanisms, and to be widely distributed throughout the body including mucosal secretions. MBL is the only collectin that activates the complement system. After binding to microorganisms, the MBL-associated serine proteases cleave and activate C4, C2, and C3. This may lead directly to complement-mediated lysis of the microorganisms or may indirectly increase the opsonization mediated by deposition of C3. When infection exceeds the capacity of the local cells and mediators for containment and/or elimination of an organism in a tissue site, a systemic host response can ensue. This response involves release of numerous APPs from the liver in response to pathogen products (e.g., endotoxins) and cytokines (e.g., IL-1, TNF-α, and IL-6 generated locally and systemically). The liver produces complement, collectins, and pentraxins together with numerous other classes of molecules involved in host defense, inflammation, clotting, cardiovascular function, and so forth. Probably because of the presence of repeated and severe infections, chronic obstructive pulmonary disorder (COPD) is characterized by the elevations of APPs, including CRP. , Systemically, these molecules may contribute to disease, because they can have inflammatory actions caused by activation of leukocytes and activation of complement. Locally, however, the antimicrobial effects of opsonins are likely to be protective. There is a growing realization that local cells in the airways can produce collectins and APPs, including complement proteins and pentraxins. ,,,, Components of this local APR appear to be induced by cytokines and TLR ligands. Pentraxins recognize a wide range of exogenous pathogenic substances and altered self-molecules and in species-specific manner behave as APPs. Transferrin is a blood plasma protein for iron ion delivery. Transferring is a glycoprotein, which binds iron very tightly but reversibly. Transferrin is also associated with the innate immune. Transferrin is found in the mucosa and binds iron, thus creating an environment low in free iron, where few bacteria are able to survive. The levels of transferrin decrease in inflammation, seeming contradictory to its function. A decrease in the amount of transferrin would result in hemosiderin in the liver. Transferring has a bactericidal effect on bacteria, in that it makes Fe 3+ unavailable to the bacteria. A transferrinemia is characterized by anemia and hemosiderosis in heart and liver. The iron damage to the heart can lead to heart failure. The anemia is typically microcytic and hypochromic (red blood cells are abnormally small and pale). The concentration of Hp in serum has been shown to dramatically increase in cows with experimental and spontaneous coliforms mastitis. The first APPs measured from milk and used as indicators of inflammation are bovine serum albumin and a-1 trypsin inhibitor. Hp and SAA were measured from milk and serum, and compared as tests to detect intramammary infection (IMI). A significant correlation was found between the concentrations of Hp in the serum and milk, but the concentrations of SAA in the serum and milk were not related. No correlation was found between Hp and SAA levels in milk. SAA could distinguish between mild and moderate mastitis. SAA and Hp for the detection of bovine mastitis clinical and subclinical mastitis can be revealed by high serum concentrations of Hp and SAA. It is also of interest that the concentration of APPs in milk from infected quarters is higher than that in noninfected quarters. By testing milk, a large number of samples are easily obtained in a way that is less stressful than obtaining a blood sample. If APPs are produced locally in the udder as a response to mastitis, they might be more rapid and sensitive markers of acute inflammation than the somatic cell count. However, future studies on the applicability of APP in milk as markers of mastitis are needed. APP is applied as unspecific markers of clinical and subclinical infections, to discriminate between acute and chronic disease and for prognostic purposes, since the duration and magnitude of the response reflect the severity of the disease and the effect of treatment. The Hp concentration remained high, and the animals subsequently showed clinical signs of the disease (depression, respiratory distress, and cyanosis). Higher Hp serum concentration prior to the clinical signs could be due to early, subclinical pathological conditions. Also, lower gaining pigs were found to have higher Hp levels than gaining pigs. The serum Hp concentration increased significantly with age in conventional slaughter pigs without clinical signs but not in slaughter pigs from high health (SPF-x) herds, indicating that subclinical disease in conventional herds may be the cause of higher serum Hp concentration in older pigs. Therefore, Hp seems to be a promising marker of health status by reflecting a broad spectrum of ongoing clinical as well as subclinical diseases. When APPs are used to assess nonhealthy animals versus healthy ones, values of single reactants are often not sensitive enough to detect a special patient or subject in a population of livestock. However, the acute phase signal obtained for an individual animal can be enhanced when the values of positive APP (rapid and slow) are combined with those of rapid and slow negative AP in an index. In starvation especially a decrease in the reactants may be expected. Radioimmunoassay (RIA) and ELISA used for APP measurement in particular of CRP are developing methods for rapid measurements of APP values. Turbidimetry is developed for APP in the dog, horse, and for the cat. Two-dimensional electrophoresis with mass spectrometry has been shown to be applicable to animal samples with the aim to measure APRs. A protein chip has been developed for the measurement of Hp and SAA in human patients. Protein microarray methodology on slides has been proposed for APP in pigs. Preliminary experiments with a monoclonal antiporcine CRP and pig acute-phase sera using methodology as described offered the possibility to measure more than 1000 pig blood sample spots on a single slide. Determination of animal health is important. APPs may provide an alternative means of monitoring animal health. An increased focus on the application of APP for this purpose has recently been developed. Due to a relatively short life in serum and high response in diseased animals, APP serum responses constitute a valid measure of a systemic response in diseased animals; APP serum responses constitute a valid measure of a systemic response to an initiating stimulus at the time of blood sampling. Like rectal temperature, APP levels are not suitable for establishing a specific diagnosis but can provide information about the extent of ongoing lesions in individual animals. At the herd level, APP might be useful for determining from where the disease is spreading by providing information about the prevalence of ongoing clinical and subclinical infections indicated by the high serum concentration of selected APP and by serving as the prognostic tool, with the magnitude and duration of the APR reflecting the severity of infection. Important points to consider before using APP as markers of animal health are the possible influence of environmental factors, handling, and other types of stress in the absence of disease. APPs have their possible use as markers of domestic animal health alone or at the herd level, for the detection and as a prognostic marker of different diseases or infections. However, an international standardization of APP assays is needed before they can be applied for the systematic health monitoring in veterinary medicine. 1. Johnson RW. Inhibition of growth by pro-inflammatory cytokines; an integrated view. J Anim Sci 1997;75:1244-55. 2. Baumann H, Gauldie J. Regulation of acute phase plasma protein genes by hepatocyte stimulating factors and other mediators of inflammation. Mol Biol Med 1990;7:147-59. 3. Whicher JT, Westacott CI. The acute phase response. In: Whicher JT, Evans SW, editors. Biochemistry of Inflammation. London: Kluwer Academic 1992. p. 243-71. 4. Eckersall PD, Conner JG. Bovine and canine acute phase proteins. Vet Res Commun 1988;12:169-78. 5. Gabay C, Kushner I. Acute-phase proteins and other systemic responses to inflammation. N Engl J Med 1999;340:448-54. 6. Beck G, Habicht GS. Isolation and characterization of a primitive interleukin-1 like protein from an invertebrate. Asterias forbesi. Proc Natl Acad Sci USA 1986;83:7429-33. 7. Huang H, Potter AA, Campos M, Leighton FA, Willson PJ, Haines DM, et al. Pathogenesis of porcine Actinobacillus pleuropneumoniae, Part II: Roles of proinflammatory cytokines. Can J Vet Res 1999;63:69-78. 8. Schijns VE, Horzinek MC. Cytokines in veterinary medicine. Wallingford: CAB International; 1997. 9. Bird S, Wang T, Zou J, Cunningham C, Secombes CJ. The first cytokine sequence within cartilaginous fish: IL-1b in the small spotted catshark (Scyliorhinus canicula) J Immunol 2002;168:332940. 10. Myers M, Murtaugh MP. Cytokines in animal health and disease. New York: Marcel Dekker; 1995. 11. Murtaugh MP. Porcine cytokines. Vet Immunol Immunopathol 1994;43:37-44. 12. Heegaard PM, Godson DL, Toussaint MJ, Tjonehoj K, Larsen LE, Viuff B, et al. The acute phase response of haptoglobin and serum amyloid A (SAA) in cattle undergoing experimental infection with bovine respiratory syncytial virus. Vet Immunopathol 2000;77:9-15. 13. Sipe JD. Acute phase proteins in chronic inflammation, In: Koj A, editor. The acute phase response to injury and infection. Amsterdam: Elsevier; 1985. p. 273-84. 14. Horadagoda NU, Knox KM, Gibbs HA, Reid SW, Horagoda A, Edwards SE, et al. Acute phase proteins in cattle: Discrimination between acute and chronic inflammation. Vet Rec 1999;144:437-41. 15. Vegad JL. Inflammation. A textbook of veterinary General Pathology. 2 nd ed. Lucknow: Publ. International Book distributing Co; 2007. p. 105-82. 16. Beutler B, Cerami A. Cahcectin Tumor necrosis factor: An endgenous mediator of shock and inflammation. Immunol 1986;5:381-93. 17. Dinarello CA. Interleukin-1 and its biologically related cytokines. Adv Immunol 1989;44:153-205. 18. Moshage H. Cytokines and the hepatic acute phase response. J Pathol 1997;181:257-66. 19. Curits MJ, Butler EJ. Response of Ceruplasmin to E. coli endotoxin and adrenal hormones in the domestic fowls. Res Vet Sci 1980;28:217-22. 20. Armani DI, Mauzy-Melitz D, Mosesson WM. Effect of hepatocyte stimulating factor and glucocorticoids on fibronectin levels. Biochem J 1986;23:365-71. 21. Gruys E, Ederen AM, Van Aslengeest SP, Kalsbeck HC, Wensing T. Acute phase protein values in blood of cattle; a indicator of animals with pathological processes. Achieve Filr Lebensmittel hygiene 1993;44:107-12. 22. Jensen LE, Whitehead AS. Regulation of SAA protein expression during the acute phase response. Biochem J 1998;334:489-503. 23. Petersen HH, Nielsen JP. Health status and clinical signs in relation to C-reactive protein concentrations in porcine serum. 4 th European Colloquium on Acute Phase Proteins, Segovia, Spain: Colloquium; 2003. p. 118-9. 24. Petersen HH, Nielsen JP, Heegard PM. Application of acute phase protein measurements in veterinary clinical chemistry. Vet Res 2004;35:163-87. 25. PiOeiro M, Alava MA, Lampreave F. Acute phase proteins on different species: A review. 4 th European Colloquium on Acute Phase Proteins. Segovia, Spain: Colloquium; 2003. p. 77-82. 26. Fritz JH, Girardin SE. How Toll-like receptors and Nod-like receptors contribute to innate immunity in mammals. J Endotoxin Res 2005;11:390-4. 27. Mantovani A, Garlanda C, Doni A, Bottazzi B. Pentraxins in Innate Immunity: From C-Reactive Protein to the Long Pentraxin PTX3. 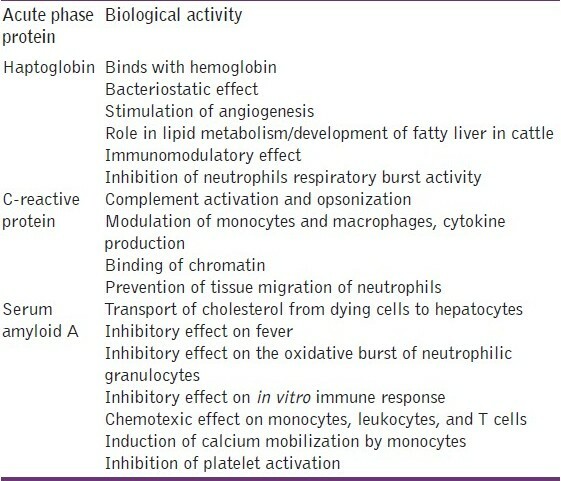 J Clin Immunol 2008;28:1-13. 28. Deban L, Jaillon S, Garlanda C, Bottazzi B, Mantovani A. Pentraxins in innate immunity: lessons from PTX3. Available from: http://www.springerlink.com/content/15818314617t51n3/abstract/ [Lasta accessed on 2010 Jul 10]. 29. Roitt IM, Delves PJ. Innate Immunity: Acute phase proteins increase in response to infection. 10 th ed. Oxford: Blackwell Publishing; 1998. p. 16-7. 30. Tillet WS, Francis T. Serological reactions in pneumonia with non protein somatic fractin of pneumocoocus. J Exp Med 1930;52:561-71. 31. Ridker PM. Clinical application of C- reactive protein for cardiovascular disease detection and prevention. Circulation 2003;107:363-9. 32. Danesh J, Wheeler JG, Hirschfield GM, Eda S, Eiriksdottir G, Rumley A, et al. C-reactive protein and other circulating markers of inflammation in the prediction of coronary heart disease. N Engl J Med 2004;350:1387-97. 33. Ballantyne CM, Hoogeveen RC, Bang H, Coresh J, Folsom AR, Chambless LE, et al. Lipoprotein-associated phospholipase A2, high-sensitivity C-reactive protein and risk for incident ischemic stroke in middle-aged men and women in the Atherosclerosis Risk in Communities (ARIC) study. Arch Intern Med 2005;165:2479-84. 34. Sattar N, Murray HM, McConnachie A, Blauw GJ, Bollen EL, Buckley BM, et al. C-reactive protein and prediction of coronary heart disease and global vascular events in the Prospective Study of Pravastatin in the Elderly at Risk (PROSPER). Circulation 2007;115:981-9. 35. Miller DT, Zee RY, Suk Danik J, Kozlowski P, Chasman DI, Lazarus R, et al. Association of common CRP gene variants with CRP levels and cardiovascular events. Ann Hum Genet 2005;69:623-38. 36. Carlson CS, Aldred SF, Lee PK, Tracy RP, Schwartz SM, Rieder M, et al. Polymorphisms within the C-reactive protein (CRP) promoter region are associated with plasma CRP levels. Am J Hum Genet 2005;77:64-77. 37. Smith GD, Ebrahim S. Mendelian randomization: Prospects, potentials, and limitations. Int J Epidemiol 2004;33:30-42. 38. Zacho J, Hansen AT, Jensen JS, Grande P, Sillesen H, Nordestgaard BG. Genetically Elevated C-Reactive protein and ischemic vascular disease. N Engl J Med 2008;359:1897-908. 39. Yamamoto M, Katoh N, Yoshikazu A. The presence of two low molecular mass proteins immunologically related to 14 kilodalton serum amyloid A in the lipoprotein fraction and their decreased serum concentrations in calves with experimentally induced pneumonia. J Vet Med Sci 1998;60:181-7. 40. Husby G, Marhaug G, Dowton B, Sletten K, Sipe JD. Serum amyloid A (SAA): Biochemistry, genetics and the pathogenesis of AA amyloidosis. Amyloid: Int J Exp Clin Invest 1994;1:119-37. 41. Yamada T, Kluve-Beckerman B, Kuster WM, Liepnieks JJ, Benson MD. Measurement of serum amyloid-A4 (SAA4): Its constitutive presence in serum. Amyloid: Int J Exp Clin Invest 1994;1:114-8. 42. Mitchell TI, Jeffrey JJ, Palmiter RD, Brinckerhoff CE. The acute phase reactant serum amyloid A (SAA3) is a novel substrate for degradation by the metalloproteinases collagenase and stromelysin. Biochim Biophys Acta 1993;1156:245-54. 43. Eckersall PD, Young FJ, McComb C, Hogarth CJ, Safi S, Weber A, et al. Acute phase proteins in serum and milk from dairy cows with clinical mastitis. Vet Rec 2001;148:35-41. 44. McDonald TL, Larson MA, Mack DR, Weber A. Elevated extrahepatic expression and secretion of mammary-associated serum amyloid A 3 (M-SAA3) into colostrum. Vet Immunol Immunopathol 2001;83:203-11. 45. Larson MA, Weber A, Weber AT, McDonald TL. Differential expression and secretion of bovine serum amyloid A3 (SAA3) by mammary epithelial cells stimulated with prolactin or lipopolysaccharide. Vet Immunol Immunopathol 2005;107:255-64. 46. Larson MA, Wei SH, Weber A, Mack DR, McDonald TL. Human serum amyloid A3 peptide enhances intestinal MUC3 expression and inhibits EPEC adherence. Biochem Biophys Res Commun 2003;300:531-40. 47. Larson MA, Wei SH, Weber A, McDonald TL. Induction of human mammary-associated serum amyloid A3 expression by prolactin or lipopolysaccharide. Biochem Biophys Res Commun 2003;301:1030-7. 48. Mack DR, McDonald TL, Larson MA, Wei SH, Weber A. The conserved TFLK motif of mammary-associated serum amyloid A3 is responsible for up- regulation of intestinal MUC3 mucin expression in vitro. Pediatr Res 2003;53:137-42. 49. Roitt IM, Delves PJ. Innate Immunity: Acute phase proteins increase in response to infection. 10 th ed. Oxford: Blackwell Publishing; 2001. p. 17. 50. Hansen S, Holmskov U. Structural aspects of collectins and receptors for collectins. Immunobiology 1998;199:165-89. 51. Ohtani K, Suzuki Y, Eda S, Kawai T, Kase T, Yamazaki H, et al. Molecular cloning of a novel human collectin from liver (CL-L1). J Biol Chem 1999;274:136-81. 52. Ohtani K, Suzuki Y, Eda S, Kawai T, Kase T, Keshi H, et al. The membrane-type collectin CL-P1 is a scavenger receptor on vascular endothelial cells. J Biol Chem 2001;276:44222-8. 53. Korfhagen TR, LeVine AM, Whitsett JA. Surfactant protein A (SP-A) gene targeted mice. Biochem Biophys Acta 1998;1408:296-302. 54. LeVine AM, Gwozdz J, Stark J, Bruno M, Whitsett J, Korfhagen T. Surfactant protein-A enhances respiratory syncytial virus clearance in vivo. J Clin Invest 1999;103:1015-21. 55. Thiel S, Jensen TV, Stover CM, Schwaeble W, Laursen SB, Poulsen K, et al. A second serine protease associated with mannan-binding lectin that activates complement. Nature 1997;386:506-10. 56. Aittoniemi J, Miettinen A, Laippala P, Isolauri E, Viikari J, Ruuska T, et al. Age-dependent variation in the serum concentration of mannan-binding protein. Acta Paediatr 1996;85:906-9. 57. Gan WQ, Man SF, Senthilselvan A, Sin DD. Association between chronic obstructive pulmonary disease and systemic inflammation: A systemic review and a meta-analysis. Thorax 2004;59:574-80. 58. Sin DD, Lacy P, York E, Man SFP. Effects of fluticasone on systemic markers in inflammation in chronic obstructive pulmonary disease. Am J Respir Crit Care Med 2004;170:760-5. 59. Schleimer RP. Glucocorticoids suppress inflammation but spare innate immune responses in airway epithelium. Proc Am Thorac Soc 2004;1:222-30. 60. Walport MJ. Advances in immunology: Complement [second of two parts]. N Engl J Med 2001;344:1140-4. 61. Gadjeva M, Takahashi K, Thiel S. Mannan-binding lectin: A soluble pattern recognition molecule. Mol Immunol 2004;41:113-21. 62. Noah TL, Murphy PC, Alink JJ, Leigh MW, Hull WM, Stahlman MT, et al. Bronchoalveolar lavage fluid surfactant protein-A and surfactant protein-D are inversely related to inflammation in early cystic fibrosis. Am J Respir Crit Care Med 2003;168:685-91. 63. Gould JM, Weiser JN. Expression of C-reactive protein in the human respiratory tract. Infect Immun 2001;69:1747-54. 64. Tsuj S, Uehori J, Matsumoto M, Suzuki Y, Matsuhisa A, Toyoshima K, et al. Human intelectin is a novel soluble lectin that recognizes galactofuranose in carbohydrate chains of bacterial cell wall. J Biol Chem 2001;276:23456-63. 65. Le L, Chi K, Tyldesley S, Flibotte S, Diamond DL, Kuzyk MA, et al. Identification of serum amyloid A as a biomaker to distinguish prostate cancer patients with bone lesions. Clin Chem 2005;51:695-707. 66. Tecles F, Spiranelli E, Bonfanti U, Ceron JJ, Paltrileiri S. Preliminary studies of serum acute phase protein concentrations in hematologic and neoplastic diseases in dogs. J Vet Intern Med 2005;19:865-70. 67. Humblet M. Acute phase proteins assessment for an early selection of treatments in growing clves suffering from bronachopneumonia under field conditions. Res Vet Sci 2003;77:41-7. 68. Biro L, Domjan G, Falus A, Jakab L, Cseh K, Kalabay L, et al. Cytokine regulation of the acute-phase protein levels in multiple myeloma. Eur J Clin Invest 1998;28:679-86. 69. Lehtolainen T, Rontvedb C, Pyrola S. Serum amyloid A and TNF-a in serum and milk during experimental endotoxin mastitis. Vet Res 2004;35:651-9. 70. Pyorala, S. Indicators of inflammation in the diagnosis of mastitis. Vet Res 2003;34:565-78. 71. Mischke R, Eckersall PD. Changes in C- reactive protein and haptoglobin in dogs with lymphatic neoplasia. 5 th International Colloquium on Animal Acute Phase Proteins Dublin: Colloquium; 2005. p. 35. 72. Gruys E, Toussaint MJ, Upragarin N, Van EA, Adewuyi AA, Candani D, et al. Acute phase reactants challenge in the near future of animal production and veterinary medicine. J Zhejiang Univ Sci B 2005;6:941-7. 73. Gronlund U, Sandgren CH, Waller KP. Haptoglobin and serum amyloid A in milk from diary cows with chronic sub-clinical mastitis. Vet Res 2005;36:191-8. 74. Campbella FM, Waterstona M, Andersenb LO, Sorensenb NS, Heeggardb PM, Eckersella PD. The negative acute phase response of serum transthyretin following Streptococous suis infection in the pig. Vet Res 2005;36:657-64. 75. Toussaint MJ, Campbell FM, Pineiro M, Gruys E. Measuring negative acute phase proteins to assess acute phase responses in starvation. 5 th International Colloquium on Animal acute phase proteins. Dublin: Colloquium; 2005. p. 14. 76. Johnson RW. Inhibition of growth by pro-inflammatory cytokines: An integrated view. J Anim Sci 1997;75:1244-55. 77. Everett BM, Kurth T, Buring JE, Ridker PM. The relative strength of C-reactive protein and lipid levels as determinants of ischemic stroke compared with coronary heart disease in women. J Am Coll Cardiol 2006;48:2235-42. 78. Johnson RW, Curtis SE, Dantzer R, Kelley KW. Central and peripheral prostaglandins are involved in sickness behavior in birds. Physiol Behav 1993;53:127-31. 79. Johnson RW, Curtis SE, Dantzer R, Bahr JM, Kelley KW. Sickness behavior in birds caused by peripheral or central injection of endotoxin. Physiol Behav 1993;53:343-8. 80. Ceron JJ, Eckersall PD, Subiela SM. Acute phase proteins in dogs and cats: Current knowledge and future perspectives. Vet Clin Pathol 2005;34:85-99. 81. Bruins MJ, Deutz NE, Soeters PB. Aspects of organ protein, amino acid and glucose metabolism in a porcine model of hypermetabolic sepsis. Clin Sci 2003;104:127-41. 82. Le Floc′h N, Melchior D, Seve B. The Importance of Dietary Tryptophan for Preserving Growth and Controlling Inflammatory Response of Weaned Pigs Submitted to Immune Stress. In: Madec F, Clement G, editors. Animal Production in Europe: The Way Forward in a Changing World. Proceedings of the in-between Congress of the ISAH. Vol. 1. St Malo, France: Colloquium; 2004. p. 239-40. 83. Bruins MJ, Soeters PB, Lamers WH, Deutz NE. L-Arginine supplementation in pigs decreases liver protein turnover and increases hindquarter protein turnover both during and after endotoxemia. Am J Clin Nutr 2002;75:1031-44. 84. Harding JC, Baarsch MJ, Murtaugh MP. Association of Tumour Necrosis Factor and acute phase reactant changes with post arrival disease in swine. J Vet Med Ser B 1997;44:405-13. 85. Petersen HH, Nielsen JP, Heegard PM. Application of acute phase protein measurements in veterinary clinical chemistry. Vet Res 2004;35:163-87. 86. Tothova C, Nagy O, Seize H, Kovac G. The effect of chronic respiratory diseases on acute phase proteins and selected blood parameters of protein metabolism in calves. Berl Munch Tierarztl Wochenschr 2010;123:307-13. 87. Niewold, TA, Tousaint MJ, Gruys E. Monitoring health by acute phase proteins. 4 th European colloquim on acute phase proteins. Segovia, Spain: Colloquium; 2003. p. 57-67.